The New Black Panther Party announced on Tuesday that they planned to carry guns at next week’s Republican Party convention, in a sign of the racial tension that is roiling the nation as President Barack Obama spoke in Dallas, to pay tribute to five white police killed by a black gunman. The NBPP has surged to the forefront of America’s consciousness following the killing of two black men by police and the retaliatory murder of five white policemen in the space of three days last week. Formed in Dallas, Texas in 1989, it is not an official successor to the Black Panther Party of the 1960s, but bears the same ideology. On Saturday gun-wielding NBPP members paraded through the streets of Baton Rouge, Louisiana to protest against the killing of Alton Sterling. 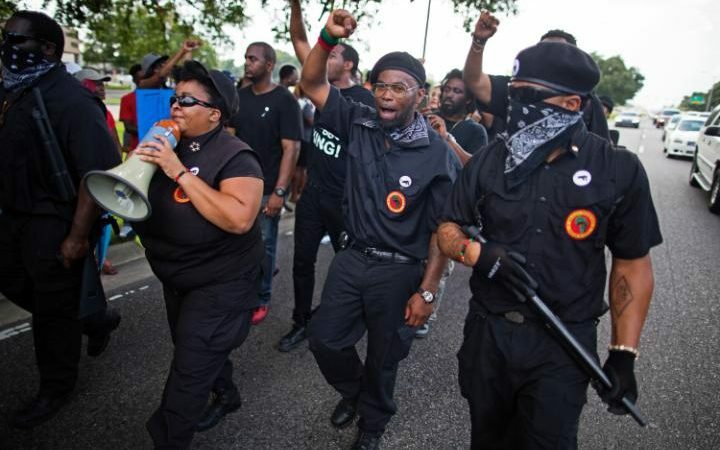 “If it is an open state to carry, we will exercise our second amendment rights because there are other groups threatening to be there that are threatening to do harm to us,” said Hashim Nzinga, chairman of the New Black Panther Party. Ohio, the state which is hosting the Republican convention, permits the open carrying of weapons. Mr Nzinga said he expected several hundred NBPP members to attend the convention, in the city of Cleveland. Another group, Oath Keepers, comprised of current and former members of the military have shown up at other tense events heavily armed and also say they plan to carry weapons into Cleveland. Cleveland officials have said there will be increased security during the Republican gathering, with resources from city, state and federal authorities. Within the convention area, the Secret Service will set up a smaller perimeter near the conference centre itself, which will have stricter security and prohibit guns. Stephen Loomis, president of the Cleveland Police Patrolmen’s Association, told The New York Times he strongly supported citizens’ rights to bear arms, but urged people not to take their guns anywhere near Cleveland’s downtown during the convention. “The last thing in the world we need is anybody walking around here with AR-15s strapped to their back,” he said. This entry was posted in Barack Obama, Civil Unrest, National Security & Terrorism, Politics, USA and tagged Alton Sterling, barack obama, Baton Rouge, bear arms, black panther party, Cleveland, Cleveland Police Patrolmen's Association, Hashim Nzinga, Louisiana, National Security & Terrorism, NBPP, New Black Panther Party, New Black Panther Party to openly carry guns at Republican convention as President Obama visits Dallas, New York Times, Oath Keepers, Ohio, politics, Republican gathering, Republican Party convention, Secret Service, social unrest, Stephen Loomis, Texas, United States. Bookmark the permalink.